Bring a large pot of water to a boil. Prepare a large bowl of ice water. Boil the lobsters for 5 minutes and plunge them into the ice water. When the lobsters have cooled, twist the tails off the bodies, remove the meat from the tails (save the shells), and cut each tail lengthwise into 2 pieces, removing the intestinal tracts. Remove the claw meat by snapping off the little pincers first, crack open the claws and remove the meat in a single piece, again reserving the shells. Remove the knuckle meat, too. Refrigerate the lobster meat until ready to use. Chop the lobster shells into 2-inch pieces for the broth. Lobster broth; heat 2 tablespoons of the oil in a large saucepan over medium-high heat. Add the lobster shells and cook, stirring until lightly browned, 3 to 5 minutes. Add half of the celery, onion, and carrot and cook, stirring until lightly browned, 3 to 5 minutes. Add the wine, tomato paste, bay leaf, coriander seeds, and crushed red pepper flakes. Bring to a boil, add 1 qt. water or broth and simmer, covered and on the lowest possible burner setting, for about 45 minutes. Sauce: lobster broth, add 2 tablespoons of the oil in a large pan over medium-high heat. Sauté the rest of the celery, onion, carrot, stir, for a few minutes. Add the garlic and continue to cook until the vegetables are tender and lightly browned, about 5 minutes. Add the lobster broth, bring to a simmer, and add the chopped tomatoes. Simmer the sauce 15-20 minutes to cook the tomatoes and thicken it. Bring a large pot of well-sea salted water to a boil. Cut the reserved lobster meat into large bite-sized pieces. Cook the spaghetti until just shy of al dente. 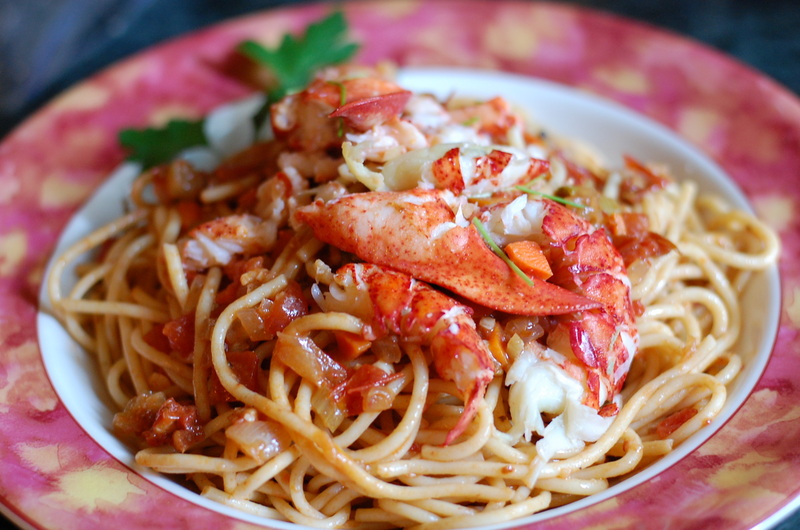 Add the spaghetti and the lobster meat to the sauce. Toss, taste and add more crushed red pepper flakes to taste. Cook for a few more minutes to heat the lobster through and to finish cooking the pasta. Serve immediately, garnish with a pinch of red pepper flakes if you like.